The tradition of the charity box is not quite as old. But its roots are respectable, dating back to Scriptural times. During the period of the First Temple in Jerusalem, we find the prototype charity box: The Temple was falling into a poor state of repair, so the High Priest made a hole in the cover of a box, which he placed conveniently near the entrance before the altar, so that all contributions could be dropped in. 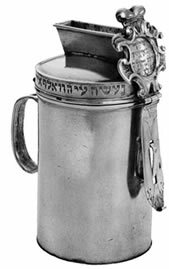 During most of their history, charity boxes were bulky affairs permanently affixed in the synagogue. Many synagogues would have a charity box with separate sections (and chinks in which to place the money) for all communal organizations. Besides upkeep of the synagogue, every Jewish community would have its special groups to collect and disburse funds for hospitality, endowering poor brides, helping the sick, aiding the poor, upkeep of Torah students, interest-free loans and other worthy causes. During the past 60 years many orginizations have produced beautiful charity boxes for you to place in your home with the knowledge that every day you can do a good deed and support our organization one nickel dime or quarter at a time. Email us to deliver a Pushka to your home.